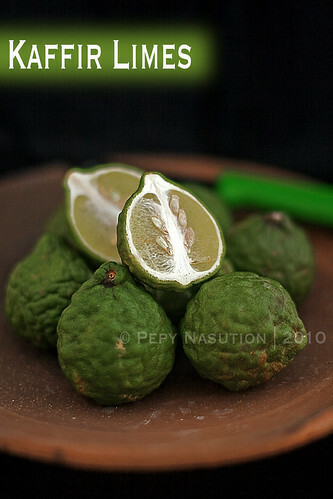 Kaffir Lime and Jeruk Limo are same green, small and very flavourful. What are the differences between kafiir lime and jeruk limo? Kaffir lime has a wrinkle skin and less juice, while jeruk limo is similar to regular lime’s look, but much more juice than the kaffir lime. After searching high and low to find the Science name in order to get the English name of Jeruk Limo, I finally found the resource of Jeruk Limo. The website gave me a complete information about Jeruk Limo in English (Thanks! ); find how big the trees are at Sybout. Again, I thanked Sybout for the permission on using a jeruk limo’s picture on that website as I don’t have any fresh resource to Jeruk Limo. Luckily, I could find fresh Kaffir Lime in Winnipeg, so I have had a picture of Kaffir Lime on my own. It’s very popular for variety of Sambal in Indonesia as well as seafood dishes. It’s very useful to reduce the unpleasant smell from fish or meat by zesting the skin since the fruit has very small amount of juice. The Oxford Companion to Food (ISBN 0-19-211579-0) recommends avoiding the name kaffir lime and instead using makrud lime because kaffir is a white Afrikaner pejorative for blacks meaning "infidel", from the Arabic "kafir" that Portugese explorers used for the native Africans. Kafir was from the Semitic K-F-R meaning "to cover." It is a derogatory term still and several alternate names such as Thai, Makrut, Wild, or Asian lime are used to avoid causing offense. LOL.. then there'll be more confusion..'Purut' or 'Makrud' – in Belgium the Thai Supermarket always write 'Kaffir Lime' and not 'Makrud'. When I started making sambal badjak from my mother's recipe, I began using two large daun jeruk purut to give it a wonderful flavor that I never experienced growing up; and also to make it my own recipe! I love the flavor and use the daun in many recipes, but have not yet used the lime itself. Thank you for educating me on jeruk limo…I was previously unaware of this variety. I also use daun jeruk purut in my Indonesian recipes.But jeruk limo and jeruk purut are two totally different kinds of jeruk.They look somewhat alike but taste very different and also the leaves are shaped different.I ordered a jeruk limo plant online from a local grower here in Florida but what they shipped me was a jeruk purut plant.Many citrus growers don’t know the difference between limo and purut.If you can tell me where I can buy a jeruk limo plant,please let me know.Thanks anyway for bringing this up.Eric. I actually got the seeds from Indonesia. I might able to get some for you if you don’t mind. @Pixen: you are so funny! Jeruk/Limau PERUT. @David: if you use the kaffir lime zest, it's much more flavourful than the leaves themselves. Thank you for the photos and descriptions of jeruk limau and jeruk purut. I just harvested my first fruit from my jeruk tree but wasn’t sure which was which. I now have fruit bearing trees of both varieties. No problem! Anyway, I forgot to have some pics taken of jeruk limau when I was back home this May. Can you please tell me where you bought your jeruk limo plant?I live in Florida where it is almost impossible to get one.Lots of jeruk purut plants but I am looking for a jeruk limo plant.Thanks.Eric. Eric, I got the seeds from Indonesia. Eric, I have some limo if you like to get the seeds, and I have some limo plants too, grow it from seed. Sorry for this late reply. I am exited to know that you have jeruk limo plants grown from seed.Do you still have them?If you do,please contact me at rickay_mellfalk@hotmail.com.Thank you so much. I’m sorry for the late reply as well. No I don’t have them anymore. 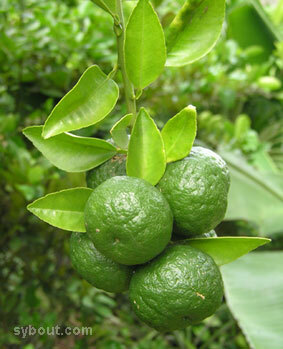 Does anyone know where I can get Jeruk Limau plants/seeds in Canada? I live in Ontario and haven’t been able to find any. Thanks! My friend said sometimes you can find it in chinatown in Toronto. I sent it to my friend who lives around there, it took 7 days ! and the limo started to turn yellow, and shipping is too expensive !